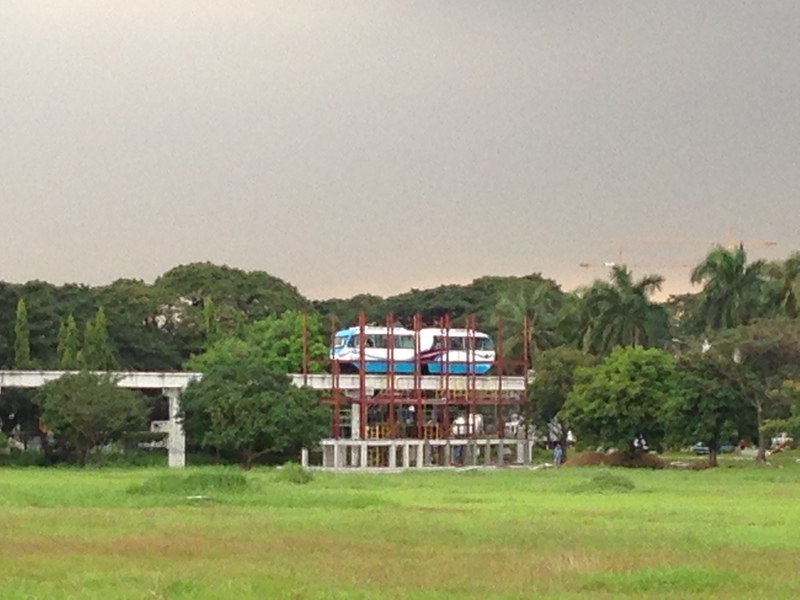 Passing by the DOST compound last week, I saw that the newer of the two AGT prototypes the Department of Science and Technology (DOST) has funded through the Metals Industry Research and Development Centre (MIRDC) is already atop the test track along Gen. Santos Ave. in Bicutan, Taguig City. The Bicutan AGT is larger than the prototype in UP. The former is a 120-passenger capacity train while the latter is a 6-passenger vehicle. 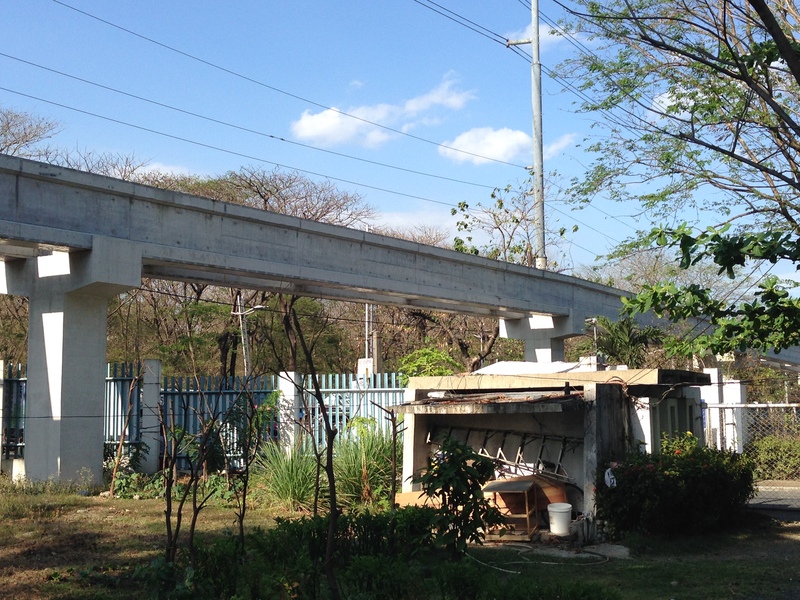 There are four on-going pre-feasibility studies on proposed AGT lines – UP Diliman in Quezon City, Litex in Quezon City, Gen. Santos Ave., Bicutan in Taguig City, and Baguio City. I am familiar with the first three, which is being implemented by UP but know little about the 4th, which is being implemented by a private consulting firm. The transport aspects (i.e., ridership estimates) of the Litex and Bicutan AGTs are almost complete and the estimated riderships are not encouraging considering the competition from road-based public transport comprised of jeepneys and tricycles along the proposed alignments. There is a similar dilemma for the loop option proposed for UP Diliman that will be competing with the jeepneys operating in the campus. That is why another option is currently being studied, i.e., a line connecting Philcoa – the UP Town Center and Aurora Boulevard via UP, C.P. Garcia Ave. and Katipunan Ave. This line presumably would have significant ridership as it passes through major traffic generators in 3 major schools (UP, Ateneo and Miriam) and a commercial area (UP Town Center). 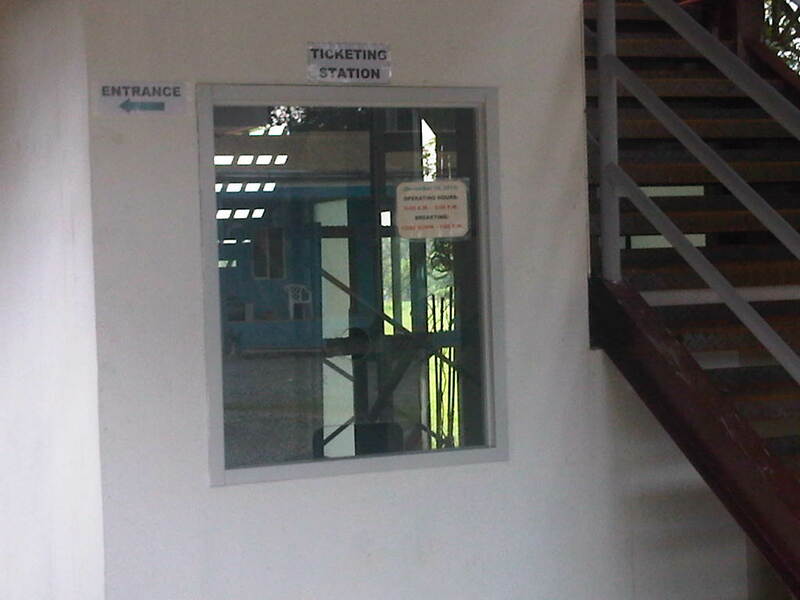 It will likely become the mode of choice for people usually passing through the UP campus from Aurora Blvd. to get to Philcoa and beyond, and vice versa. And with the traffic congestion along Katipunan, a transit system with its own right-of-way should have better travel times compared with road-based transport. A big issue about the AGT vehicles is the certification required before these are allowed to carry passengers in a real system. The current vehicles are prototypes so these will be subject to more refinements towards the model that would actually go into service in the foreseeable future. There is no update on this and the MIRDC and DOST don’t seem to be seeking more rigid and independent tests to certify the safety and integrity of this Philippine-made system. Perhaps the DOTC can help them on this through the LRTA or the PNR? Back in Tokyo last February, I made sure that time to go and ride the Yurikamome Line, an automated guideway transit (AGT) system serving the Odaiba area and beyond. These areas are reclaimed land from Tokyo Bay and features many modern buildings. It used to be that the only transit system resembling rail serving the area was the Yurikamome. It was relatively expensive compared to both Tokyo JR and subway lines and there weren’t much choices so people, especially residents in that area welcomed bus services and the Rinkai Line of the Tokyo Waterfront area Rapid Transit (TWR), which is the same company that operated the Yurikamome AGT. The AGT is a driverless train with rubber tires and running on guideway tracks instead of rail. Capacities are similar to light rail and are more suitable to residential and medium intensity commercial or office areas. The Yurikamome is popular with children whom their parents usually take on the front seat for a magnificent view of the line and adjoining areas. I think some parents tell their children they can pretend to be the train driver given the best seats are right at front. The AGT is driverless and that means you can be seated up front. Escalator and platform at Daiba Station. The approach to Odaiba Kaihin Koen Station from Daiba Station shows the equivalent of a switch (rail) for the guideway tracks along the other direction. Section along the Rainbow Bridge. Note the roads on either side of the AGT guideways. Auxiliary guideway tracks to allow trains to change guideways direction. 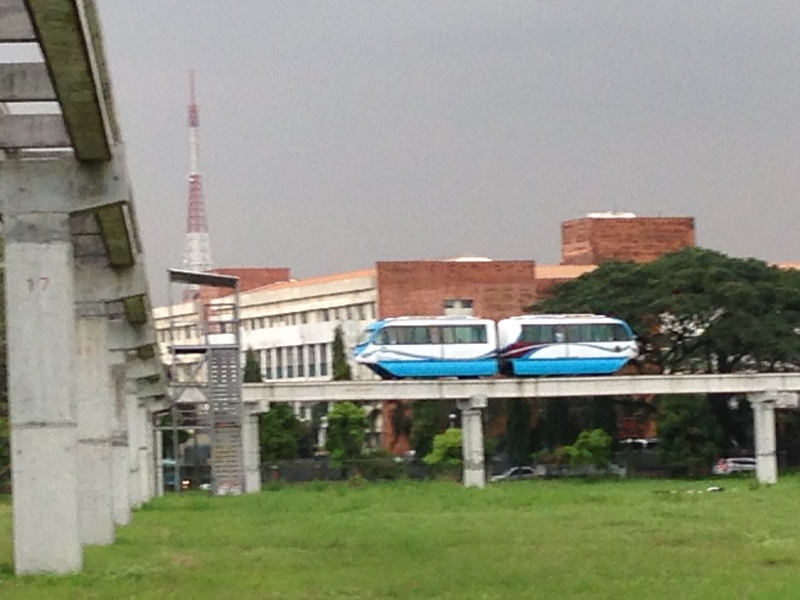 Note that the train picks up electricity along its sides from the rails along either side of the guideway. This allows for continuous movement though there are breaks as the train shifts position. 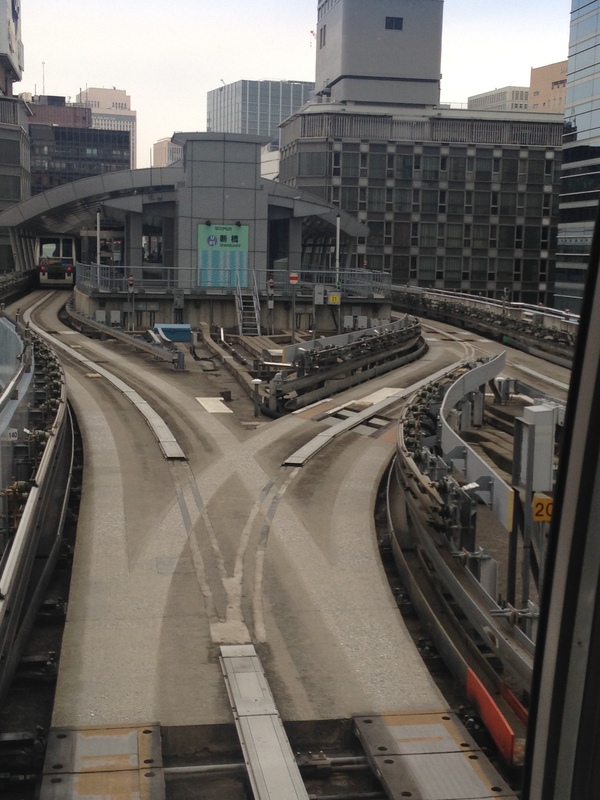 The guideway to between Takeshiba and Shiodome Stations feature what appears as a rubberized strip for better traction for the tires to the guideway tracks. The approach to Shiodome Station. The approach to Shimbashi Station shows the AGT equivalent of a switch to allow arriving vehicles to change directions towards the platforms of the end station.